Purchasing a new vehicle for yourself or a family member is a big decision. Four County Import Center offers honest and reliable pre-purchase inspections that can provide a peace of mind before you buy, save money on costly repairs, and provide a negotiating tool between you and the seller. If you want to feel confident when buying a new vehicle, bring it to the ASE certified technicians at Four County Import Service for an unbiased inspection. Our #1 is your satisfaction, and we generally care about our customers. Give us a call at 301-829-8600 or stop into our Mt. Airy, MD auto repair facility today! 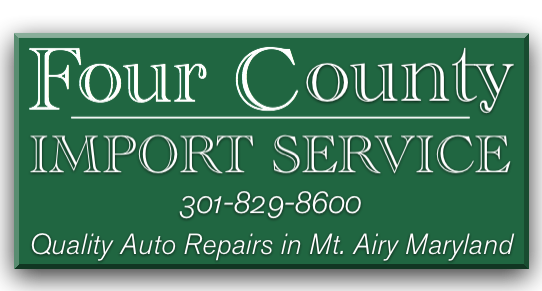 Four County Import Center Mount Airy, MD and surrounding areas in Montgomery County, Howard Count, Frederick County, and Carroll County with quality pre-purchase auto inspections for all makes and models of vehicles. Give us a call at 301-829-8600 or stop in today! Honest Information. We provide unbiased evaluations. Repair Shops may overlook problems so they can do the repairs. Our objective is your satisfaction.